My family just returned from Hawaii. We travel to Hawaii often and usually stay on the beach for the length of our stay. My children are older now and ready to experience more of what Hawaii has to offer. This year, we decided to take the kids on a few excursions. On the top of my list was to take a trip on the Atlantis Submarine in Waikiki. I always love seeing sea life in it’s natural environment. My kids aren’t confident enough to go snorkelling yet so I felt that going on the Atlantis Submarine would be quite the treat for my kids. I also thought that going in a submarine would be a unique experience. Our Atlantis Submarine adventure started at the Hilton Hawaiian Village in Waikiki. We checked in early and headed to the Hilton Pier. Once on the dock we received our boarding passes and Dive Log books. My kids loved looking through the dive log as we waited for the Discovery, the boat that would transport us to the submarine location. I was so excited that we would be taking a boat to the submarine. I really enjoyed seeing the Waikiki skyline as we cruised in the ocean. After about 20 minutes we arrived at the location where the submarine was. The Atlantis XIV emerged from the ocean and the passengers on the submarine disembarked and our group embarked. The process was well organized and clear. Once onboard we were seated and given a bit of information about our submarine trip. The Atlantis XIV is quite large, it holds 64 passengers including staff. I was immediately impressed by the size of the submarine. The kids and I had lots of room, my son even sat on my lap for most of the trip. Our host was filled with great facts about sea life, submarines and more. He would alert us when something extra cool was in view and was quite funny. I also enjoyed the relaxing music that played while we were in the submarine. We weren’t nervous at all but I assume this music would help calm those that are. Our submarine trip went on a fun route, we saw the University of Hawaii “pyramid” artificial reefs, passed over the “Pali O Pono” ancient lava flow encrusted with coral reef, passed two MidPacific airplanes and the St. Pedro, a sunken ship. It was easy to determine how deep we were in the ocean from the depth indicator by our seats. I was very impressed when we went well beyond 100 feet. We saw so much sea life on our trip. My son spotted an eel, we saw many sea turtles, huge schools of fish and a Spotted Eagle Ray. The duration of the entire trip was about 1 1/2 hours. Overall this was a great experience for the entire family. We loved the entire trip so much. My kids keep talking about the Atlantis Submarine and have asked to go back when we return to Hawaii again. I highly recommend taking your family on the Atlantis Submarine when visiting Waikiki. It’s an experience the entire family will remember forever. The Atlantis XIV sails several times per day everyday from the Hilton Pier in Waikiki. It is recommended to pre-book online but you can also book one hour before any dive. Transportation for Waikiki visitors on the Atlantis Submarines Trolley to the Hilton Pier is complimentary. 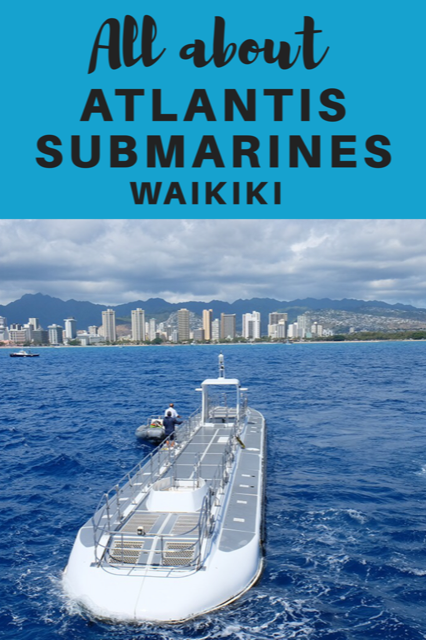 To learn more about the Atlantis Submarine in Waikiki check out their website. You can also follow them on Facebook and Instagram for up to date photos and special promotions. I’d love to know, have you been on a submarine before? What was your experience like? Disclosure: Although Atlantis Submarines offered my family a complimentary tour on the Atlantis XIV, all thoughts and opinions are my own. wow, that must of been quite the experience for the family! I would love to do this so much. I’m sure my 2 kids would love it as well. Now THIS is an experience & a lifelong memory for the kids! It’s so surreal. My children would think this is the coolest. What a super cool experience!! I have never heard of this although I haven’t been to Oahu for over 10 years now so I guess I just haven’t been looking into fun excursions there. Next time we go I will definitely be checking this out – looks awesome! Wow !! What an amazing trip and fantastic family memories. I would want to do this for sure if I ever was able to take a trip to Hawaii. I am fascinated by anything under water. Thank you for all your great info. Looks like fun! What a great experience! wow that looks so cool! i went in one once long time ago at the West Edmonton mall, when they had it, it was fun. Loving the blue skies and turquoise waters! this looks amazing! someday I’ll take my grandsons there. Thank you for sharing for photos and first hand experience. Oh how I’d like to make it to Hawaii. Thanks for the info. Looks like an awesome trip for the kiddos! Great pictures! I would love to take them but not sure if they can get me into the submarine. I have troubles with tight spaces. Love the photos! It sure is making Hawaii enticing…well, even more so! Wow what a great experience to give to your children! Travelling is so important! Haven’t made it to Hawaii yet but I’d sure love to! Oh wow, now this sounds amazing I would be giddy like a kid if I went on this submarine, just remarkable!! WOW..What a sight!! Kids must have loved it. Alot of history too!! Does my Baby Need a Canadian Passport?